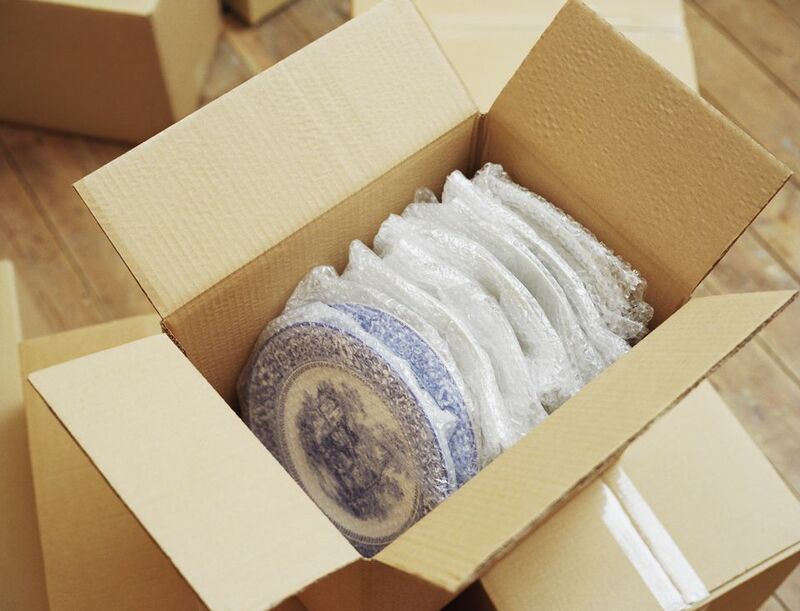 If you're packing and moving house, you'll need to know how to pack fragile glassware to ensure it gets to your new home in one piece. So when it comes to packing the kitchen, dishes, including plates, need to be packed properly. Find out how with this easy step-by-step guide to packing plates and flatware to ensure they safely arrive at your new home. You'll need several medium sized boxes. You can purchase new boxes, or you can pack with used boxes. Just keep in mind that if you pack with used boxes, make sure they're sturdy, not overly used and can hold the weight of what you're packing. You'll also need packing paper or newsprint, packing tape and a mark to label the box. Note that if you use newsprint or newspapers to pack, you'll have to wash the dishes well after you unpack to remove any ink that remains behind. Whether you're packing with a used box or a new one, you should also reinforce the bottom with packing tape. Add a couple of layers of tape then test the bottom by pushing on it with your hand. Take the packing paper or newsprint and ball up several sheets into wads of paper. You'll use this to line the bottom and top of the box. Choose a medium size box that you've reinforced and add the wadded up paper making sure they cover the bottom. You could also use bubble wrap, but bubble wrap is expensive and difficult to recycle. Place the first plate in the center of the top sheet and fold one corner of the sheet over the plate until it's completely covered. Place the two plates in the box of the box on their sides. Plates should never be packed flat as this can lead to breaking. If the box encounters any force, plates on their edge can sustain a lot more pressure than if they're laid flat on the bottom of the box. Mark the box as fragile, list the items on the outside and their location, such as "kitchen" or "dining room." If you're moving instead of hiring movers and you're renting a moving truck, make sure you load the boxes on the truck to prevent any breakage. Boxes marked as fragile should be packed on the floor of the truck rather than high on top of other items. You should pack fragile boxes beneath large pieces of furniture such as desks or tables or secure them in cabinets whose doors you can fasten closed. This way boxes won't shift during the move. If you don't have a lot of packing paper or bubble wrap, use linens or towels as cushioning. The box you use shouldn't be too big. Remember, the maximum weight should be 50 lbs maximum.